The Local Economic Development in the Balkans (LEDIB) programme is a five-year programme for support to local economic development with a focus on development of the Small and Medium-Sized Enterprise (SME) Sector. In line with the strategy of the Danish Neighbourhood Programme, LEDIB covers Nisava District and is in support of the poverty reduction strategies of Serbia. The development objective of the programme is socially balanced economic development and employment creation in the Nišava District in Serbia. Nisava District Agricultural Advisory Service is established with the purpose to enhance the economic development in agriculture in Nisava district. Association of clusters and consultants established with the goal to support cluster development and business associations of Southeastern Serbia. LEDIB Programme mission was conducted between 2007-2012. Business development activities continue Cluster House Nis ( www.clusterhouse.rs ) and Agrozem Nis ( www.agrozem.org ). 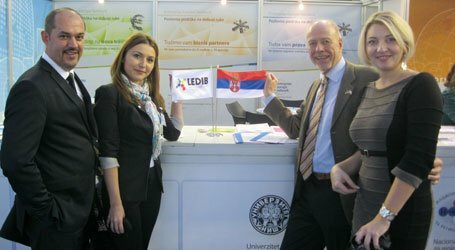 The potentials of the South will be presented at the XI International Fair Business Base taking place at Belgrade Fair, Hall 1, from November 29 to December 3, 2012.